Tampa, FL. 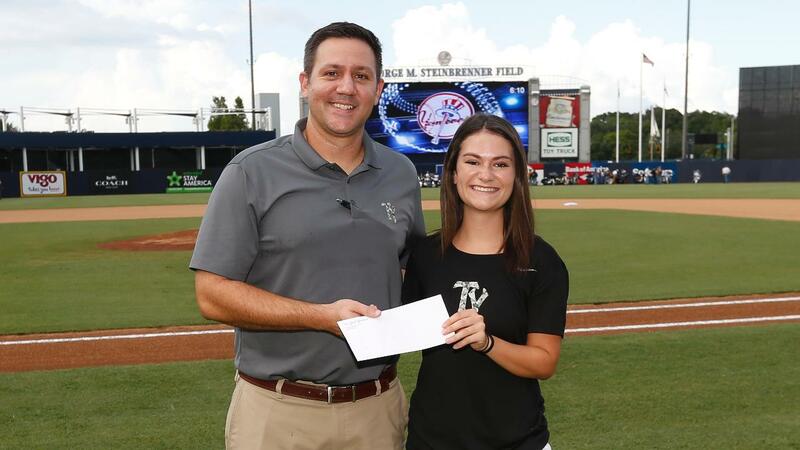 - The Tampa Yankees, in conjunction with the Florida State League and the Miami Marlins, are pleased to announce Lyndsay Kane as their 2017 scholarship award winner. The Florida State League Scholarship committee award 12 individuals with educational scholarships. The committee approved the awards after a review of the applications submitted by all the Florida State League teams. Lyndsay Kane is currently enrolled at the University of South Florida where she is pursuing a degree in Nursing and has a 3.7 GPA. She previously attended Palm Harbor University in the medical magnet program for High School and then went to St. Petersburg College for one year. This is Lyndsay's 5th season working the Tampa Yankees. Lyndsay was honored at the Tampa Yankees home game on July 15th at George M. Steinbrenner Field. In addition, she was introduced during a pre-game ceremony at the Miami Marlins game on Sunday, July 30th along with the other Florida State League teams' award winners. The Miami Marlins/Florida State League scholarship program is awarded to students that are an employee of, or the child or grandchild of an employee of the participating club and must be at least a high school junior by the 2018 fall term. The Miami Marlins have sponsored this program for the past seventeen years and have contributed over $160,000 to the Florida State Program. The Tampa Yankees are the Single-A Advanced affiliate of the New York Yankees. For more information on the Tampa Yankees visit www.tybaseball.com or call (813) 673-3055.